1855. 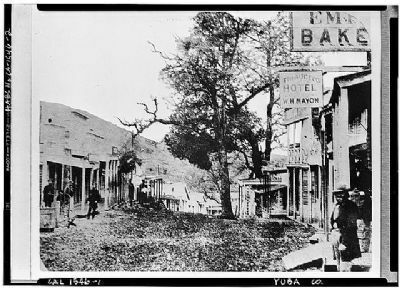 Largest town in eastern Yuba County, and at height of its prosperity contained a church, theater, stores, hotels, and saloons. Old Wells Fargo Office and Stewart Bros.; Store restored, 1928, and dedicated to pioneer men and women of Timbuctoo. Location. 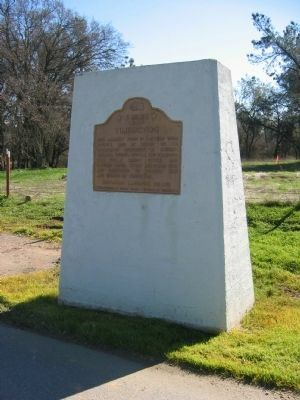 39° 13.016′ N, 121° 19.05′ W. Marker is near Penn Valley, California, in Yuba County. Marker is on State Highway 20, on the right when traveling east. Touch for map. Marker is in this post office area: Penn Valley CA 95946, United States of America. Touch for directions. Other nearby markers. At least 8 other markers are within 5 miles of this marker, measured as the crow flies. The Yuba River Bridge at Parks Bar (approx. 0.9 miles away); Sucker Flat (approx. one mile away); Church of the Immaculate Conception (approx. 1.3 miles away); Smartsville Grocery (approx. 1.3 miles away); Smartville / Smartsville (approx. 1.3 miles away); Edward James McGanney (approx. 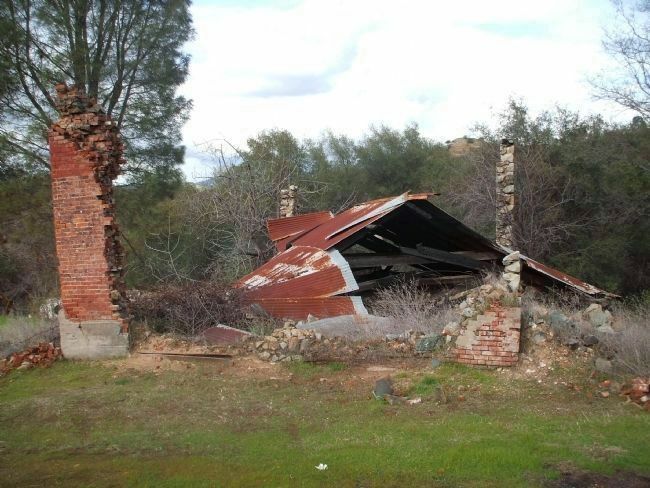 1.3 miles away); Mooney Flat Hotel (approx. 2.4 miles away); Hammon Grove (approx. 4½ miles away). — Submitted December 8, 2008, by Lane Parker of San Francisco, California. 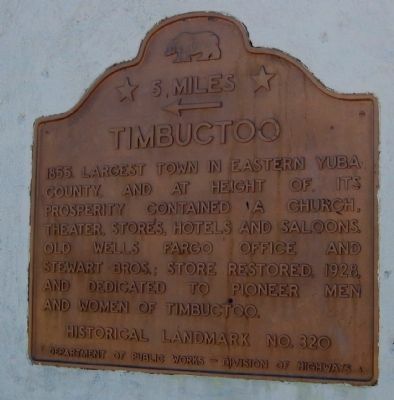 Timbuctoo became a California State Registered Historical Landmark (No. 320) on July 12, 1939. — Submitted December 24, 2008, by Lane Parker of San Francisco, California. "Old Wells Fargo Office & Stewart Bros. Store (1855) Restored and dedicated to the memory of the pioneer men and women of Timbuctoo. 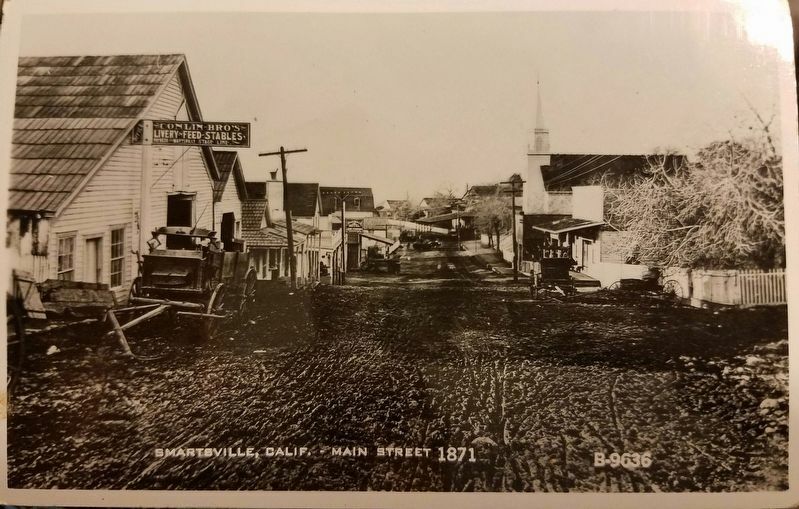 May 10, 1925, by Marysville Parlor No. 6, N.S.G.W. Marysville Parlor No. 162, N.D.G.W. Presented by Wells Fargo Bank & Union Trust Co., San Francisco." Note: The lettering on the plaque is all uppercase. — Submitted January 6, 2009, by Lane Parker of San Francisco, California. 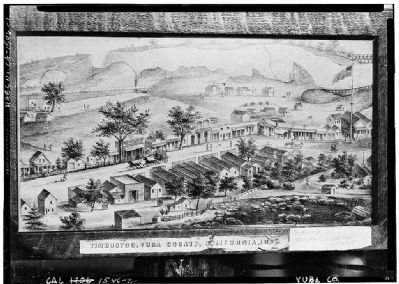 Photocopy of 1867 lithograph (from Wells Fargo Bank Historical Museum, San Francisco, California, 1867) Photographer - George Barrington, Lithograph dated 1862. August 1940 GENERAL VIEW OF MAIN STREET AND ENVIRONS. 6. 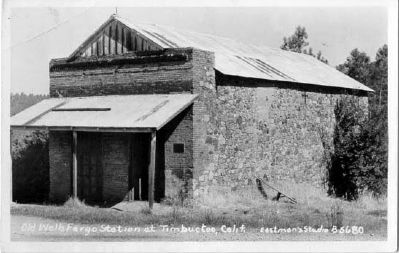 Vintage Postcard - Old Wells Fargo Station at Timbuctoo, Calif. This is the report of the dedication ceremony for the plaque on the Wells Fargo Building. 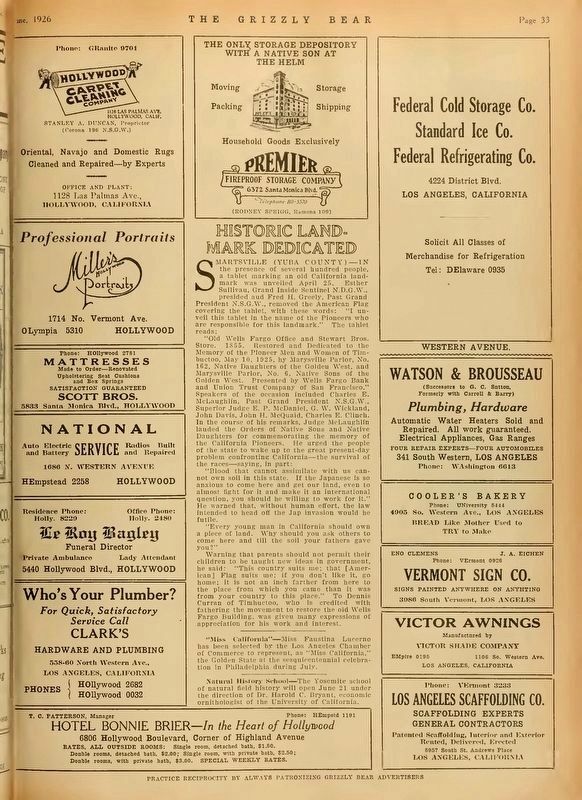 While the State Parks CHL plaque states the store was restored in 1928, this article from 1926 says that it was restored in 1925. All indications are that this marker has been lost. If recovered, NSGW/NDGW would like to receive it back for remounting in a roadside monument. More. Search the internet for Timbuctoo. Credits. This page was last revised on February 21, 2018. This page originally submitted on December 5, 2008, by Syd Whittle of El Dorado Hills, California. This page has been viewed 3,505 times since then and 39 times this year. Last updated on July 19, 2012, by Michael Kindig of Long Beach, California. Photos: 1. submitted on December 5, 2008, by Syd Whittle of El Dorado Hills, California. 2. submitted on August 13, 2016, by Terri Sottile of Oceanside, California. 3. submitted on December 5, 2008, by Syd Whittle of El Dorado Hills, California. 4. submitted on April 12, 2009, by Syd Whittle of El Dorado Hills, California. 5. submitted on April 9, 2009, by Syd Whittle of El Dorado Hills, California. 6. submitted on December 8, 2008, by Syd Whittle of El Dorado Hills, California. 7. submitted on February 20, 2018, by James King of San Miguel, California. 8. submitted on December 24, 2008, by Lane Parker of San Francisco, California.